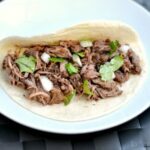 This authentic Barbacoa Recipe is a simple slow cooker meal that makes the most tender, flavorful, delicious barbacoa beef. Does anyone else love Chipotle as much as I do? One of my favorite things to order there is their Barbacoa. 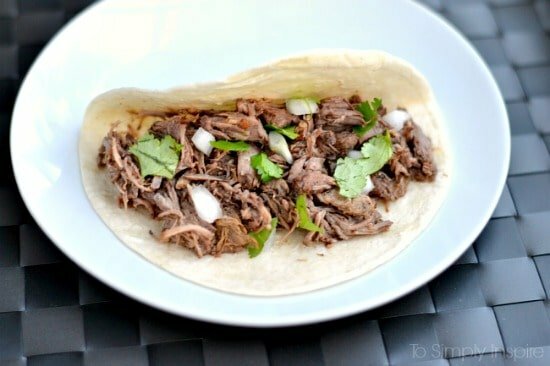 This barbacoa recipe is the real deal! I have never cooked with chipotles in adobo sauce before so this is a first for me. They are partly responsible for the delicious flavor of this dish. I found them in the same Mexican foods aisle at the grocery store right by the greens chili’s. It’s easy to add everything to your slow cooker before you leave for the day. Your house will smell completely amazing when you walk through the door. 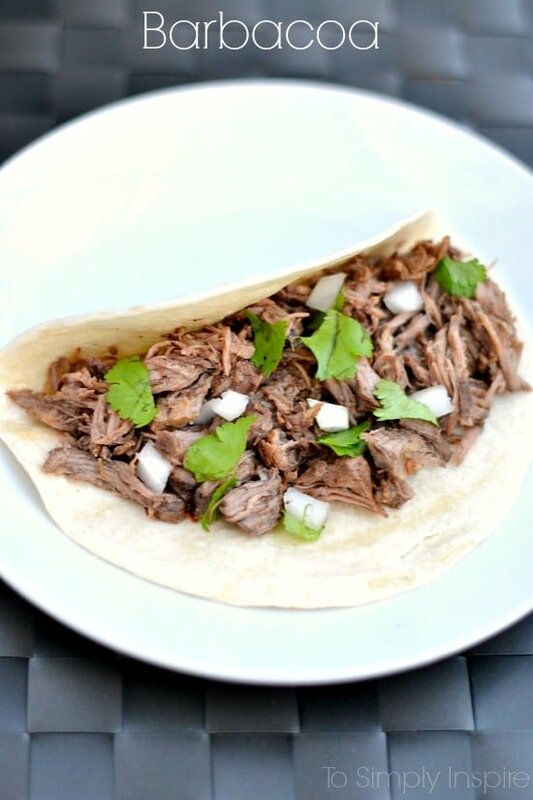 Interestingly, Barbacoa originally was prepared from parts of a cow’s head (mainly cheeks). You would also see goat or venison used as well. It was slow cooked in a brick lined oven dug into the ground in Central Mexico. Today, we know it more commonly as a”brisket”. I actually bought chuck roast already cut into chunks for stew. You could also use a beef brisket too. You can serve it in soft or hard tortillas topped with cilantro lime rice, black beans, pico de gallo, guacamole, cheese and sour cream. Or forget the tortilla and make it a rice bowl or even a salad. However you decide, it’s all fantastic! 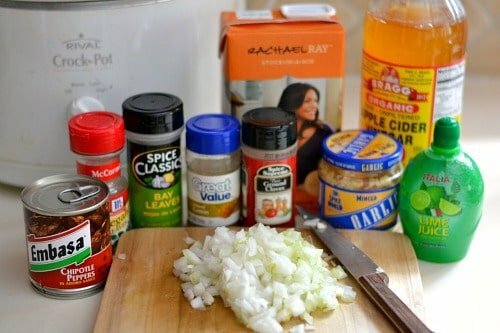 In a medium sized bowl, combine all the ingredients except the meat, and stir to combine. Pour the sauce over the meat and gently toss to combine. Shred the beef using 2 forks inside the slow cooker. Use a pair of tongs or a slotted spoon to serve the barbacoa. Refrigerate in the juices in a sealed container. It also freezes well. Here are a few other slow cooker recipes to make and have ready when you get home after work. This is so much better than what I planned for dinner tonight. Featuring your delicious recipe on the Found & Foraged Linky Party tonight! The barbacoa at Chipotle is a must for me. I love it…and now, thanks to you, I can make it myself! Doing the Snoopy dance over here. Thanks for sharing on Found & Foraged! We will just love the flavors in this dish, it looks delicious. Your post is awesome and thanks so much for sharing it with Full Plate Thursday! My whole family loves Chipotle. I can’t wait to try this recipe! Thank you so much for linking it up at This Is How We Roll Thursday. I know my family is going to love it. Great recipe! Thanks so much for sharing this with all of our Let’s Get Real readers. My husband loves barbacoa. I’ve never eaten it, but the man will certainly be happy to do a few more things around the house if I serve this up for him. When I make chicken for tacos it comes out pretty juicy and frankly quite messy. I make do, but do you have any tips for making this less messy? 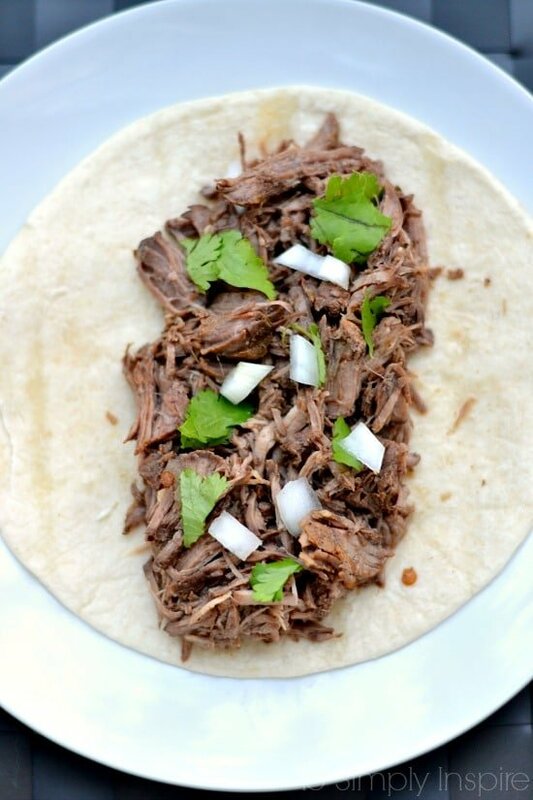 DYING over this – I have a serious obsession with pulled barbacoa & I can’t get enough. YUM! It is delicious Gina. The house smells SO good too! Sounds delicious! 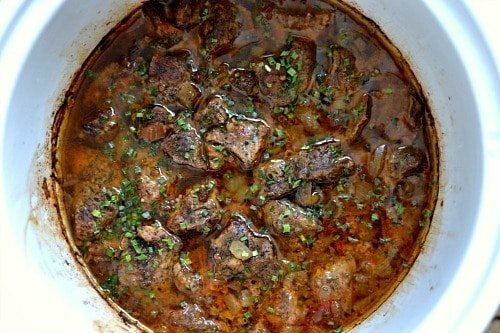 I love slow cooker recipes and think this would be a big hit at my house, pinning to try. Thanks for sharing at What’d You Do This Weekend? I hope you will join us again this Monday! I love slow roasted beef recipes and this looks great! Thanks for sharing at the showcase link party! Pinned and stumbled! This looks so delicious, pinning it! This is making my mouth water, I love barbacoa! And I bet the house smells amazing!